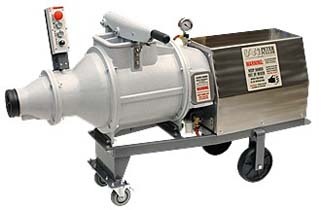 The Vacuum Power Wedger combines the capability of batch mixing with the convenience of pugmill output and the ease of vacuum deairing. All your scrap goes right back into the hopper and is recycled, vacuum deaired and pugged. Large Hopper: The 9" x 9" hopper door allows for easy loading of up to 140 Ibs. of clay per batch. Pugmill Output: Switch to PUG after a batch is completely mixed, and the Power Wedger unloads itself in the form of 3.5" diameter deaired logs. Sealed Chamber: Leaving moist clay in the Power Wedger is not a problem. All the openings are sealed so clay will stay moist indefinitely. On Wheels: The VPM-60 has 8" diameter wheels and front casters for easy transport for cleaning and storage. Maximum Batch Capacity: 140 lbs. Hopper Door Size: 9" x 9"